Candace H. Johnson-For Shaw Media George Bicknell, of Chicago, director of photography, films Abbey Bobzin, of Kenosha, Wis., and Jessica Trznadel, of Westchester, with his Lumix camera in Scene 13 for their horror movie called, Tread This Fantasy" in the playground at Caboose Park in Lake Villa. 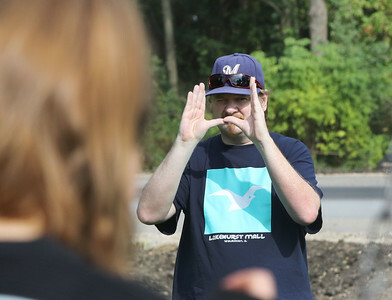 Candace H. Johnson Director Brian Naydol, of Antioch uses a slate to start filming Scene 13 in front of lead actress, Jessica Trznadel, of Westchester, in the horror film, "Tread This Fantasy" at Caboose Park in Lake Villa. 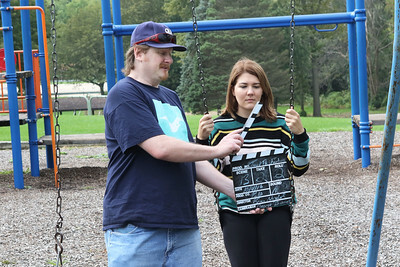 Candace H. Johnson Director Brian Naydol, of Antioch uses a slate before shooting Scene 13 with actresses Abbey Bobzin, of Kenosha, Wis., and Jessica Trznadel, of Westchester, for his horror movie, "Tread This Fantasy" at Caboose Park in Lake Villa. 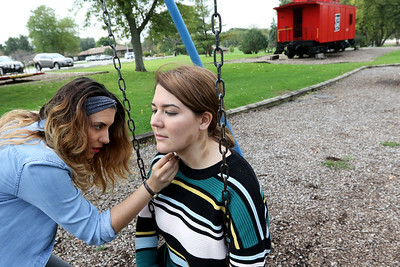 Candace H. Johnson-For Shaw Media Abbey Bobzin, of Kenosha, Wis., uses makeup to put bruise marks on Jessica Trznadel, of Westchester, before they both act in Scene 13 for the horror movie, "Tread This Fantasy," in the playground at Caboose Park in Lake Villa. 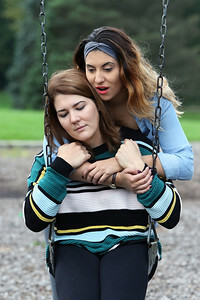 Candace H. Johnson-For Shaw Media Actress Jessica Trznadel, of Westchester shoots an emotional scene with Abbey Bobzin, of Kenosha, Wis., for the horror movie, "Tread This Fantasy," in the playground at Caboose Park in Lake Villa. 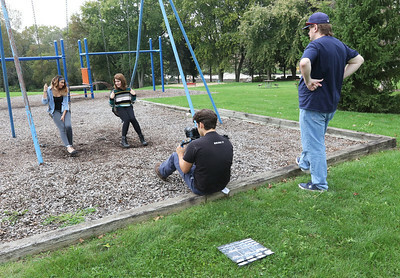 Candace H. Johnson-For Shaw Media George Bicknell, of Chicago, director of photography, and Brian Naydol, of Antioch, director, work with actresses Abbey Bobzin, of Kenosha, Wis., and Jessica Trznadel, of Westchester on Scene 13 for their horror movie called, Tread This Fantasy" in the playground at Caboose Park in Lake Villa. 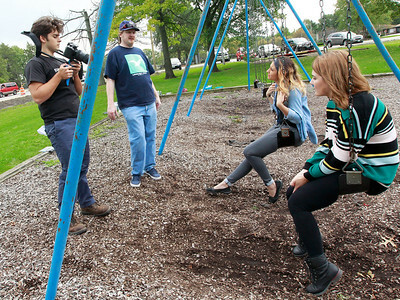 Candace H. Johnson-For Shaw Media George Bicknell, of Chicago, director of photography, and Brian Naydol, of Antioch, director, position their Lumix camera to film Scene 13 of their horror movie called, "Tread This Fantasy" at Caboose Park in Lake Villa. Candace H. Johnson-For Shaw Media Director Brian Naydol, of Antioch frames his shot of lead actress, Jessica Trznadel, of Westchester, before shooting Scene 13 for his horror movie, "Tread This Fantasy" at Caboose Park in Lake Villa. 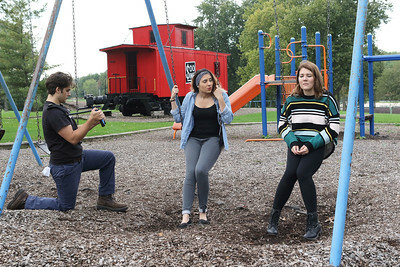 Candace H. Johnson-For Shaw Media George Bicknell, of Chicago, director of photography, and Brian Naydol, of Antioch, director, shoot Scene 13 with actresses Abbey Bobzin, of Kenosha, Wis., and Jessica Trznadel, of Westchester for their horror movie called, Tread This Fantasy" at Caboose Park in Lake Villa. 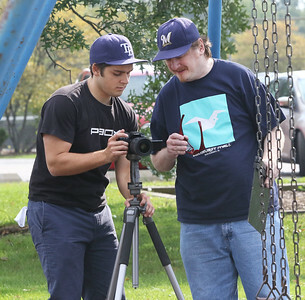 George Bicknell, of Chicago, director of photography, and Brian Naydol, of Antioch, director, position their Lumix camera to film Scene 13 of their horror movie called, "Tread This Fantasy" at Caboose Park in Lake Villa.